I spent most of my childhood years in front of a Tv doing one of two things: watching Teenage Mutant Ninja Turtles or Godzilla movies. Godzilla has a special place in my heart, and every now and then I’ll indulge myself on Netflix. The King of the Monsters was able to grip my attention from the first time I saw him at four years old. It was the original Gojira that set a love affair into motion for years to come. IDW has had intermediate success with the Godzilla franchise, and with Godzilla: The Half Century War they look to make something truly great. The book follows Ota Marukami and his encounters with Tokyo’s biggest pest. The first chapter adds to the Godzilla story that most of us know. Giant irradiated lizard that breaths fire attacks Tokyo, gets lured into the ocean, and is killed by a creation from some mad scientist. Ota and the troops under his command turn out to be responsible for many of the happenings behind the scenes, and they are responsible for saving many lives. This is the first time the world has come in contact with monsters, and Ota’s troop is one of few military men to survive the attack. Godzilla was thought to be dead, but signs show the world is not yet rid of him. Given Ota’s experience he and a fellow survivor are recruited to become the beginning of the Anti Megalosaurus Force. They are group of soldiers created specifically to do battle with monsters, and Godzilla is their prime target. The art in this book is something to behold. The ordinary people have somewhat of a cartoony look to them, but when the big guy is on the page it is jaw dropping. The detail imparted on him is outstanding. From every scale, to the plates on his back it is just great. Stokoe did all Godzilla fans a favor here, and gave us something that is a visual treat. It’s just enough guy in a rubber suit and actual giant lizard to please everyone. This is more than just a monster book. This is a book about a man’s life that just so happens to involve the characters that we love. 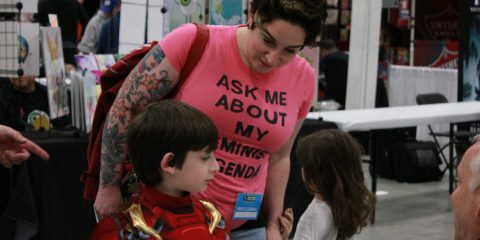 Comics have evolved too far to be just tanks shooting monsters for thirty pages. There has to be some driving force behind it. By following the guys tasked with bringing down mythical beasts, I think we have that force. It anchors us in human emotion while allowing our minds to wonder into the impossible. 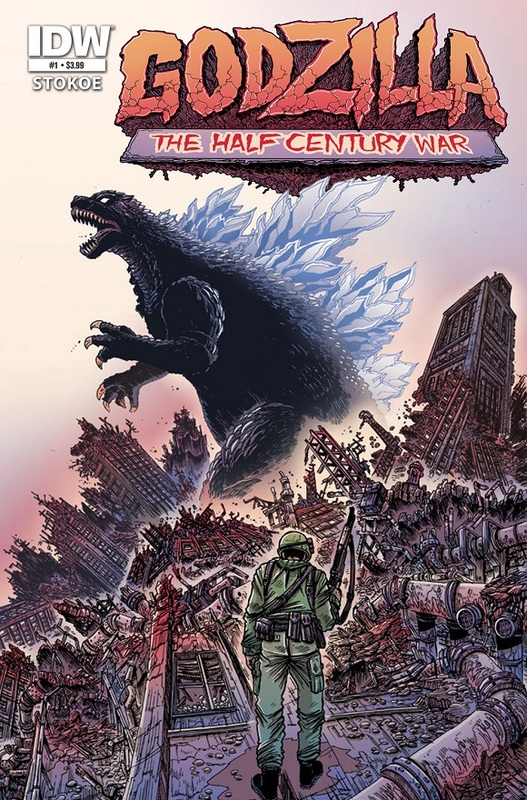 I was pleasantly surprised with Godzilla: The Half Century War #1. It’s a really nice start to a series I will certainly follow up on. The art is great, and the story looks to be another romp through time, ala American Vampire…Plus giant radioactive lizards.